In 1998, with the help of the Grand Traverse Regional Land Conservancy, Benzie County secured a Michigan Natural Resources Trust Fund grant and purchased 66 acres on Railroad Point, the largest undeveloped parcel remaining on Crystal Lake. Railroad Point Natural Area has since been expanded twice, most recently in 2012, and now includes 209 acres that extends from the shores of Michigan’s ninth largest lake south to the Betsie River, a state-designated Natural and Wild-Scenic River. When combined with the adjoining, state-owned Crystal Lake Outlet property, the preserves protect 4,300 feet of lake frontage or more than half of Crystal Lake’s publicly-owned shoreline. Inland Railroad Point features upland forests, wetlands, steep-sided bluffs and portions of Outlet Creek, the warm-water stream that connects the lake to the Betsie River. Such a diverse habitat supports an equally wide range of wildlife, from whitetail deer, bobcats, black bears, otters and coyotes to birds such as wild turkeys, great blue herons, wood ducks and the red-shouldered hawk, a threatened species in Michigan. Two trails provide access into Railroad Point. The multi-purpose Bestie Valley Trail skirts Crystal Lake for a mile on the northern edge of the natural area while the Mary Margaret Johnson Trail, open only to foot traffic, heads inland from Mollineaux Road to views of Crystal Lake. Even though they are not connected, a short segment of Mollineaux Road allows you to combine the trails for an enjoyable bike-and-hike outing. The Mary Margaret Johnson Trail was completed in 2011 to replace the old logging roads visitors were using. 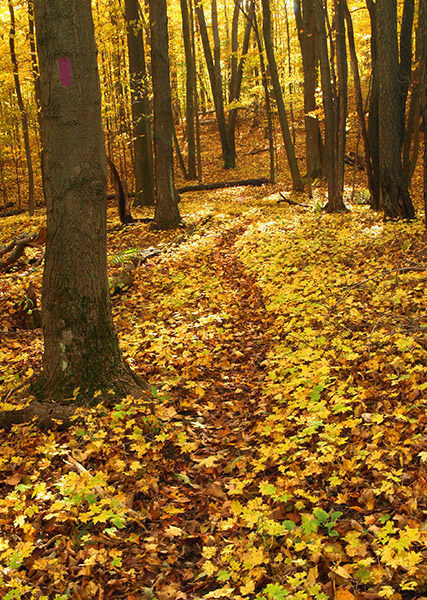 The foot trail dips and climbs as it follows the natural contours of the terrain for a round-trip hike of 1.3 miles. From the trailhead, the Mary Margaret Johnson Trail enters the upland forest to skirt the edge of a wooded hollow. There’s a bit of climbing here as you dip in and out of a small ravine before reaching a junction guarded by a pair of huge oak trees at Mile 0.3. To the east (right), a loop continues to follow the rolling contour of the bluff and within a quarter mile reaches the its edge, where there are views of Crystal Lake through the foliage. The trail skirts the bluff briefly, then heads inland, returning to the junction at Mile 0.75. Head right. 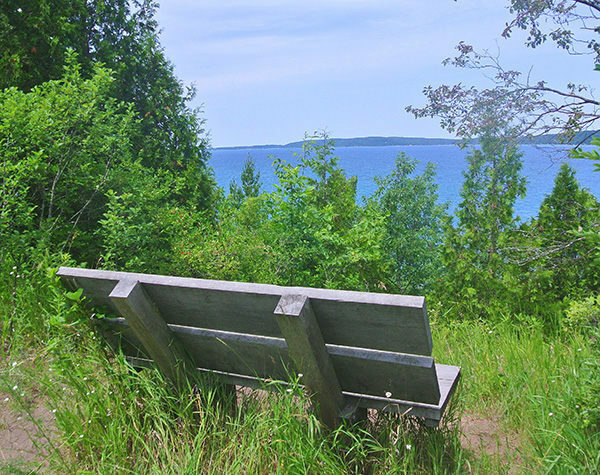 Within 100 yards the trail breaks out of the forest into a small opening on the edge of the lakeshore bluff where a bench has been placed. Below is the brilliantly blue water of Crystal Lake. 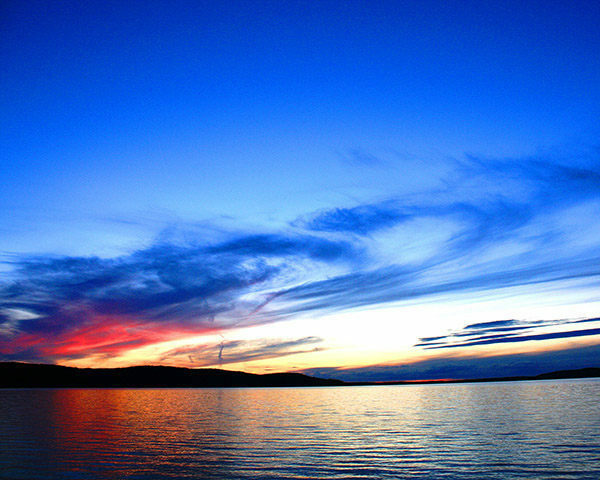 The 9,854-acre lake is 8 miles long and has more than 20 miles of shoreline. The average depth of Crystal Lake is 70 feet but its deepest point is 165 feet, the reason its diverse fishery includes lake trout. What makes the lake so beautiful to many are the ridges and bluffs that encircle it that were once home to a small downhill ski area. The bench in the natural area is perched on top of one of the highest at almost 700 feet, or 116 feet above Lake Michigan. To return to the trailhead, backtrack on the trail bypassing the loop to reach Mollineaux Road in less than a half mile. There are no facilities or drinking water at the Railroad Point trailhead. There is are no vehicle entry fees at Railroad Point. The natural area is open year-round. The trailhead for the Mary Margaret Johnson Trail is posted along Mollineaux Road, which forms a loop off of M-115, 3 miles east of M-22 in Frankfort or 2 miles west of US-31 in Benzonia. For more information, contact the Grand Traverse Regional Land Conservancy (231-929-7911).